th . Crowned 8th. Sepr. 1831". On the reverse the Queen’s portrait is inscribed, "QUEEN ADELAIDE. Crowned 8th. Sepr. 1831". At the lower right hand corner of each portrait can be seen the name of the engraver "Kennedy". He was an independent engraver and was presumably commissioned by Chetham & Robinson to produce the copper plates for their pottery. Between the two portraits is a print of a royal crown with the word "REFORM" above and with "LONG LIVE THE KING" below. Reform of the electoral system in England and Wales was a significant issue when George IV died in 1830 and his brother William IV ascended the throne. In 1832 The Representation of the People Act (also known as the Reform Act) was passed abolishing some of the worse political abuses and extending the franchise to the middle classes. A number of portraits of King William IV were produced to celebrate his ascension to the throne. This portrait is very similar to that on the mug and could have served as a source. King William IV is depicted wearing Ceremonial robes, including a high-collared tunic, over which is the collar of the Order of the Garter. The print is inscribed His Most Gracious Majesty / King William IV / J. Rogers, Sc. Print in support of the King and "Reform". 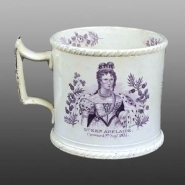 Earthenware mug printed in purple with portraits of King William and Queen Adelaide. 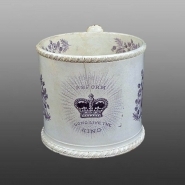 Made to celebrate their coronation on 8th September, 1821. The initial mark C & R for the maker Chetham & Robinson is printed in purple on the base. The mug has a band of gadrooning at the rim and the foot and an angular handle. The print of the King on one side has the inscription "KING WILLIAM the IVth . Crowned 8th. Sepr. 1831". On the reverse the Queen’s portrait is inscribed, "QUEEN ADELAIDE. Crowned 8th. Sepr. 1831". At the lower right hand corner of each portrait can be seen the name of the engraver "Kennedy". He was an independent engraver and was presumably commissioned by Chetham & Robinson to produce the copper plates for their pottery.